Flightball is online football played in real-time by the airplanes that are flying above Belgium. Our client gave us a call. 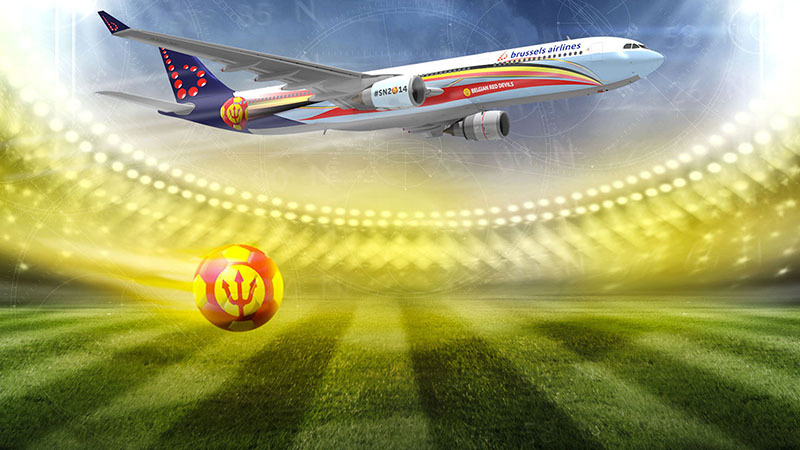 Two weeks before the World Cup Football, Brussels Airlines wanted to give away two seats on the official airplane that would fly the Belgian national team to Brasil. We came up with an online game to give away those seats, and named it ‘Flightball’. So we made this happen. 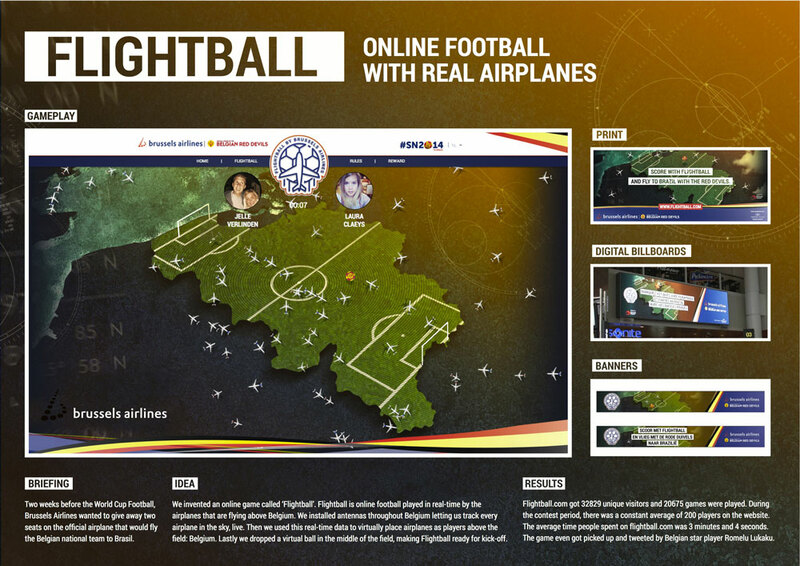 Flightball is online football played in real-time by the airplanes that are flying above Belgium. We installed antennas throughout Belgium letting us track every airplane in the sky, live. Then we used this real-time data to virtually place airplanes as players above our football field: Belgium. Lastly we dropped a virtual ball in the middle of the field, making Flightball ready for kick-off. Players could log in with Facebook connect, and we assigned them an opponent. After that, they could sit back and let the real airplanes in the sky play for them. Like in real football, when the ball got kicked in your opponent’s goal, you won the game. Each victory gave you more chance to win the entire contest. The two top ranked Flightball players were invited to play the big finals at Brussels Airport just before take-off. Flightball was announced with print ads, digital billboards, online banners, and through social media. Flightball.com got 32829 unique visitors and 20675 games were played. During the contest period, there was a constant average of 200 players on the website. The average time people spent on flightball.com was 3 minutes and 4 seconds. The game even got picked up and tweeted by Belgian star player Romelu Lukaku.